These 74 exoplanets, which orbit 28 stars, are about the size of Earth, and their circular trajectories stand in stark contrast to those of more massive exoplanets, some of which come extremely close to their stars before hurtling far out in highly eccentric, elongated orbits. TORONTO, May 12, 2015 — We may complain a lot about the weather on earth but perhaps we are much better off here than on some alien worlds, where the daily forecast is cloudy, overcast skies in the morning and scorching heat in the afternoon. A team of international astronomers including York University scientist Professor Ray Jayawardhana have uncovered evidence of daily weather cycles on six extra-solar planets using sensitive observations from the Kepler space telescope. “Despite the discovery of thousands of extra-solar planets, what these far-off worlds look like is still shrouded in mystery,” says lead author Lisa Esteves, graduate student at the University of Toronto. 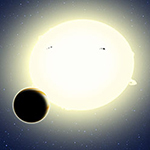 In their paper entitled “Changing Phases of Alien Worlds: Probing Atmospheres of Kepler Planets with High-Precision Photometry” published today in the Astrophysical Journal, the team analyzed all 14 Kepler planets known to exhibit phase variations, and found indications of cloudy mornings on four and hot, clear afternoons on two others. The Australian discovery of a strange exoplanet orbiting a small cool star 500 light years away is challenging ideas about how planets form. “We have found a small star, with a giant planet the size of Jupiter, orbiting very closely,” said researcher George Zhou from the Research School of Astrophysics and Astronomy. In the past two decades more than 1,800 extrasolar planets (or exoplanets) have been discovered outside our solar system orbiting around other stars. The host star of the latest exoplanet, HATS-6, is classed as an M-dwarf, which is one of the most numerous types of stars in galaxy. Although they are common, M-dwarf stars are not well understood. Because they are cool they are also dim, making them difficult to study. Astronomers have used NASA’s Hubble Space Telescope to take the most detailed picture to date of a large, edge-on, gas-and-dust disk encircling the 20-million-year-old star Beta Pictoris. The new visible-light Hubble image traces the disk in closer to the star to within about 650 million miles of the star (which is inside the radius of Saturn’s orbit about the Sun). “Some computer simulations predicted a complicated structure for the inner disk due to the gravitational pull by the short-period giant planet. The new images reveal the inner disk and confirm the predicted structures. This finding validates models, which will help us to deduce the presence of other exoplanets in other disks,” said Daniel Apai of the University of Arizona. The gas-giant planet in the Beta Pictoris system was directly imaged in infrared light by the European Southern Observatory’s Very Large Telescope six years ago. Despite a malfunction that ended its primary mission in May 2013, NASA’s Kepler spacecraft has discovered a new super-Earth using data collected during its “second life,” known as the K2 mission. University of Hawaii astronomer Christoph Baranec supplied confirming data with his Robo-AO instrument mounted on the Palomar 1.5-meter telescope, and former UH graduate student Brendan Bowler, now a Joint Center for Planetary Astronomy postdoctoral fellow at Caltech, provided additional confirming observations using the Keck II adaptive optics system on Maunakea. The Kepler spacecraft detects planets by looking for planets that transit, or cross in front of, their star as seen from the vantage of Earth. During the transit, the star’s light dims slightly. The smaller the planet, the weaker the dimming, so brightness measurements must be exquisitely precise. To enable that precision, the spacecraft must maintain a steady pointing.